Purchasing SCUBA gear is a significant investment. Ideally, you use this equipment for years to come. The process can be overwhelming, but we are here to help! 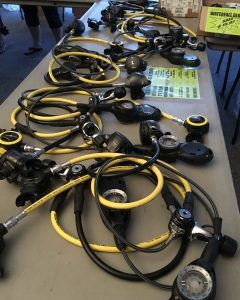 Check out these important tips for finding gear that best suits your diving needs. If there is one over-arching rule to purchasing SCUBA gear, it is to find something comfortable for you. If you’re not sure where to start, ask your local Force-E team for guidance. Whether you are experienced and transitioning into technical diving, or a newbie purchasing your first set of gear, we are here to answer questions and help you through the process. Fitting a Mask: A comfortable mask plays a key role in having a great dive. To fit a mask, first hold it up to your face. The “skirt,” or outside flexible lining, should lay smoothly against your face. Water may leak into a mask if lines or hair inhibit the skirt. This leads to distractions, a decrease visibility, and reduced comfort during the dive. If the skirting looks clear, hold your breath and gently press the mask onto your face, pushing between your eyes. Ideally, the mask should stay on your face without you having inhale significantly. If the mask seals well, feels comfortable, and offers a good range of vision, it’s probably the mask for you! Fitting Fins: Most open-heel fins come in sizes XS – XL and require booties. Both booties and full-foot fins are sized like shoes. However, they are predominantly based on men’s sizes, so ladies usually need to go down a size or two. Once the fins is on, it should fit without uncomfortable pressure anywhere on your foot. Not sure which style of fin is best for your diving needs? Just ask any of our Force-E staff and we’ll help you pick out something right for you! Wearing A Wetsuit: My personal motto when helping someone find a wetsuit is that it may feel awkward, but shouldn’t feel uncomfortable. We are not used to walking around in a body-hugging onesie, and wetsuits fit differently than much other clothing. Each wetsuit design has a coordinating size chart that utilizes height and weight to help determine fit. Men’s sizes vary from XS – XL, but women’s wetsuits are usually sized by number. Guys can use their t-shirt size as a starting indicator, whereas women should refer to their dress size. Remember, a wetsuit holds and heats a layer of water next to your skin. 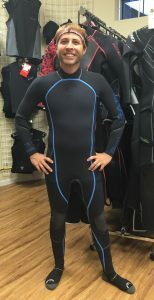 Wearing a loose-fitting suit allows water to continuously enter and escape, and greatly detract from the wetsuits temperature-retaining abilities. A wetsuit should sit closely on your body, without limiting your range of motion. If folds or loose pockets are present, try a suit one size down. Fitting a BCD: The size chart that accompanies most BCDs helps you find the right fit. To choose a BCD, first loosen all the straps and undo the cumberbund. Put the BCD on, and then adjust the cumberbund around your waist. While men will generally wear this right above their hips, women tend to have shorter torsos, so their BCDs may sit higher on the body. Next, clip the chest strap and pull it tight enough that neither shoulder strap can slip off. Lastly, pull down to adjust your shoulder straps. Make sure that all straps have a little room left over for adjustment, either to tighten or loosen the BCD. This is especially important if you plan to dive in cooler water. Layering a thicker wetsuit or vest will add bulk to your body. 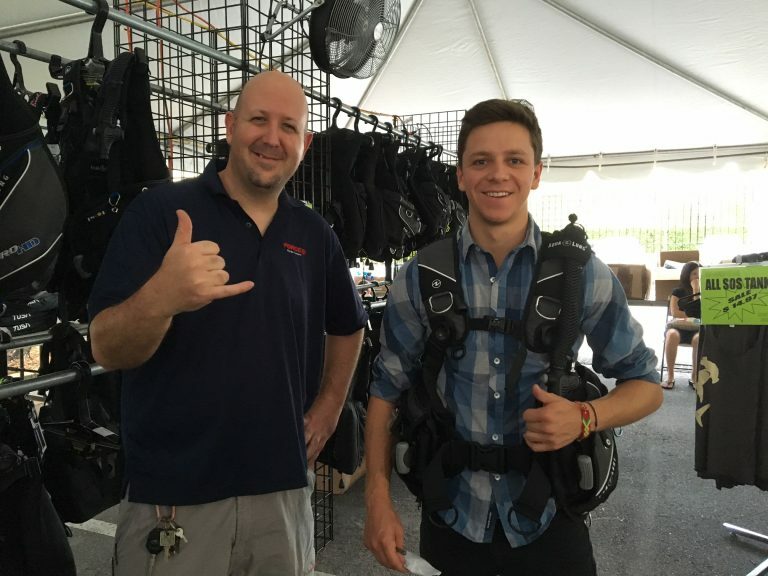 Force-E staffer Fred Fons helps Nico Vergara find his new BCD during Force-Es 2016 tent sale. Jacket-style BCDs tend to hug your body, whereas back-inflated BCDs are more minimalist. Trying on a variety of styles to determine the right choice for you. Finding the Right Regulator: Differences in regulator design may not always be apparent from the outside, but they have a huge impact on your comfort underwater. A balanced regulator offers consistent airflow. An unbalanced regulator, although sometimes less costly, may make breathing more difficult in deeper water or when a tank is low. Another important distinction is a DIN vs Yoke regulator. A DIN 1st stage screws directly into the valve of a tank. Technical divers often prefer DIN style regulators. A yoke 1st stage screws onto a tank valve, and is the most common valve you will find when traveling. Of course, there are converters for each type of regulator to cover all the bases. Remember, you can customize a regulator hose and mouth piece for your comfort (or to accessorize!). Choosing A Computer: Computers are arguably the most influential piece of dive gear that you will own. They play a direct impact on your dive profile and planning. 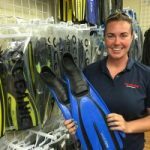 Choose a dive computer that will fit your current needs, but also take into account future interests. Are you interested in an air-integrated model that requires a high-pressure port on your 1st stage? Do you plan to try trimix diving in the coming months? Talk to a Force-E staffer to choose a computer best suited for your diving needs. In addition to the capabilities of your computer, also consider the best choice for your setup. Watch-style computers are small and compact. You can clip a computer in a console to your BCD so that it sits within your view at all times. Some feature one button, and others two. Each design is a bit different from the other, and preferences vary by each diver. We hope to see you at the Labor Day Tent Sale!